This project was launched in spring 2015. 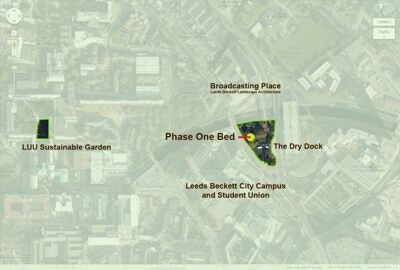 The plan is to develop an experimental edible garden in the green triangle of LCC land surrounding the Dry Dock pub - between Leeds Beckett University City Campus, the multi-story car park on Woodhouse lane, and the Inner Ring Road (beyond which lies Broadcasting Place - the &apos;rusty&apos; building). Phase One establishes the viability of a food plot in this very public location, and provided valuable research concerning the challenges it will face. These included maintenance viability (especially during vacations), vandalism, risk from contamination (soil, air-borne and others - see Science Research), extent of engagement and harvesting, survival of stock, effectiveness of signs, efficiency of experimental growing systems and structures, etc. 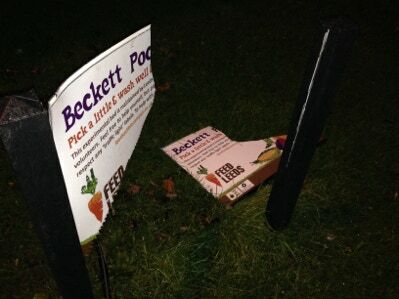 If the project is deemed successful, additional phases will be planted, possibly to designs by Beckett landscape students. 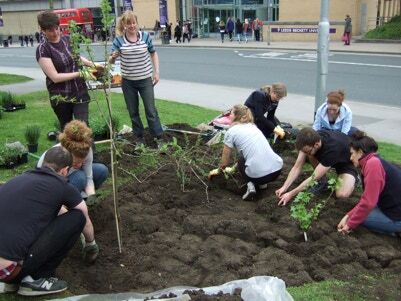 Borrowing from the experience of Bardon Grange at UoL, the project may in time begin to provide produce for The Dry Dock, Union Bars and other local food outlets. 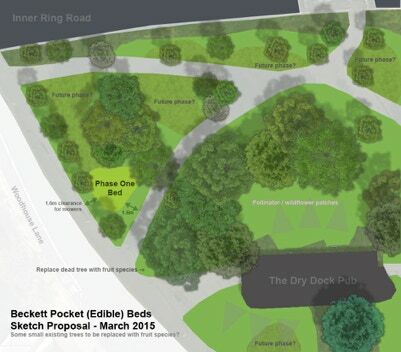 Phase One comprises one modest &apos;pocket forest garden&apos; - plus, it is hoped, a few pollinator patches and fruit tress. 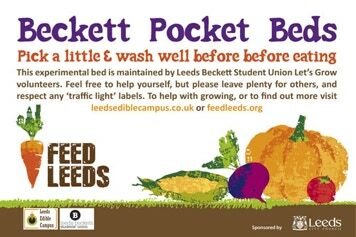 Planting supervision and materials are being provided by Bardon Grange and LCC Parks and Countryside, and ongoing management of the beds will be by Leeds Beckett Student Union&apos;s Let&apos;s Grow volunteers. The site will remain in the ownership of LCC. 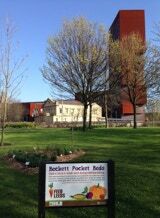 To help with the planting and growing, please contact Ryan Frankland here.